These close friends estimate that in the past 10 years, they've planted over 10,000 trees to help revive the once-barren environment around Yeli Village in northeast China. Although we – as a collective – have more than previous generations could have ever dreamed of, the majority of us are quick to make excuses when it comes to doing ‘work’ we are less than inspired by. Take out the trash? Nah, pass. Walk the dog? Nah, she’ll be fine. Plant a tree? No, too busy. On and on, excuses to avoid activities which are necessary for an orderly environment and collaborative world to exist are quick to be offered by many in our society. …Which is why this story of a blind man named Jia Haixia and his friend, a double amputee with no arms named Jia Wengi, is fascinating and beyond inspiring. 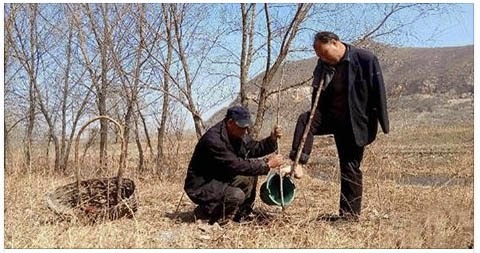 The duo have spent more than 10 years replanting trees to revive the once-barren environment around Yeli Village in northeast China. Born blind in one eye and having lost the other in a 2000 work-related accident, Haixia depends upon the sight and kindness of others to help him accurately navigate the world. And having lost both his arms in an accident when he was only 3 years old, Wengi has developed incredible abilities to engage in the world around him with his lower limbs, but still lacks the ease others take for granted when it comes to carrying out simple, daily tasks. Together, however, the pair have leased 8 acres of land from the government and have begun replanting the land with trees to protect the village from flooding. After climbing back down, Haixia digs holes in the ground to plant the cuttings. Wengi’s job is then to take care of the growing saplings by watering them. With this unique system of teamwork, the friends estimate that they’ve planted over 10,000 trees in over a decade. And according to another article from Xinhua News Agency, Haixia may be soon be able to regain sight in his left eye thanks to an operation that a team of health care professionals are willing to perform for free, making this story even more heartwarming! Truly, positivity does exist in this world, and personal initiative to co-create a greener, more sustainable environment is growing. It’s now up to the people to demand news that showcases more than the negative happenings presently being showcased. Perhaps their inspiring example will inspire you and others to think twice before making excuses to carry out tasks others may only dream of being able to act upon. Find this story inspiring? Please share the positive new so no good deed goes unnoticed.